Following on the previous blog posts, this is a list of the other accidents and deaths on the Meltham Branch Line from 1890 onwards that I found whilst researching through old newspapers. Once again, this is primarily based on researching the Huddersfield Chronicle archives. Vandeleur Earnshaw2 was born around 1857 in Meltham, the son of wood cutter Abraham and Martha Earnshaw. He married Sarah Hannah Duckitt on 23 March 1878 at Meltham Mills and they raised a family in Meltham, where he worked as a domestic gardener. It seems the accident meant that Vandeleur could no longer work as a gardener and the 1901 Census lists him as a 44-year-old “silk boiler” (most likely working for Jonas Brook & Bros. Ltd.) living with his wife and seven children at 18 Shady Row, Meltham. He died in 1916, aged 60, and was buried on 15 November at Meltham Mills. Their son, Serjeant Hilton Earnshaw was killed in action on 31 August 1916 and is buried at the St. Amand British Cemetery, Pas-de-Calais, France. He was serving with the 9th Battalion Duke of Wellington’s (West Riding Regiment). On Thursday afternoon, as the 3:40 train from Huddersfield to Meltham was entering the Meltham Station, the porter, Eastwood, a youth about 16 years of age, was seen to run alongside the train and attempt to catch hold of the carriage handle. He succeeded in getting hold, but lost his footing, the train dragged him a short distance on the platform, when he left his hold, and the train turned him over, and but for the timely assistance of Wright Smith, the head porter, he would in all probability have been killed. His eyes are badly knocked and swollen, and his knees bruised. It is expected that he will be all right again in a few days. The Huddersfield Daily Examiner (05/Feb/1915) reported on the celebrations for Wright and Ellen Smith’s golden wedding anniversary. The couple, who married on 4 February 1865, were then living at 4 Beaumont Street in Netherton. After spending fifty years together, the couple continue to live happily in their cottage at Netherton, and although he has passed the allotted span of three score years and ten Mr. Smith may frequently be found working on the land with neighbouring farmers. For over thirty years he was employed by the Lancashire and Yorkshire Railway Co., first at the Huddersfield goods warehouse, and afterwards at Meltham, where he held the position of foreman porter prior to his retirement about five years ago. Wright was born around 1840 in Almondbury and most likely died in 1927, aged 87. His wife was Ellen Dunn, also born around 1840, who likely died in 1922, aged 82. They had no children. Following the completion of a district council meeting in Meltham, a number of people waited for the 8:28pm departure to Huddersfield but there was no sign at all of the train and the station staff seemed unsure as to what exactly had happened, other than a rumour of a derailment and an assurance that there would likely be no more trains that evening. The reporter set off walking down the line and arrived at Healey House station around 9pm, where he found the station master in “blissful ignorance of the accident, but wondering much what had become of the missing train”. Now joined by as gas works employee who had been waiting for the train to Huddersfield at Healey House, the pair set off into the darkness, lighting matches to aid them through Netherton Tunnel and then Butternab Tunnel. Exiting the latter, they found the cause — a landslip had “encumbered the line for some distance” and the train heading towards Huddersfield had ploughed into the debris, causing a slight derailment. The driver, named Mallinson, was praised by the reporter for keeping a cool head and assisting some dozen passengers — none of whom had sustained any injuries in the accident — to walk down the line to Lockwood station. A team of workmen had already arrived on a train from Mirfield to the other end of the landslip and the reporter was offered the opportunity to ride on the footplate back to Lockwood. From there, he had to walk in the heavy rain back to Huddersfield, having missed the last tram of the day. Some would be satisfied with nothing less than a holocaust of the whole of the passengers, and others added the horrors of a fire to the appalling catastrophe which their imagination pictured. The reality fell far short of this. Meltham wine merchant Thomas Edward Taylor (of Messrs. Taylor Bros.) was lucky not to have been injured when he tried to board the 7:25am train from Meltham Station which was already in motion.4 According to the newspaper report, he pushed a signalman to one side, grabbed hold of the second-class carriage and was dragged down the platform — one foot on the carriage and one still the platform. The train was quickly stopped and a guard took down the merchant’s details. This was almost certainly the Thomas Edward Taylor born around 1858 in Meltham, the son of woollen weaver Uriah Taylor and his wife Martha (née Sedgwick or Walshaw). The various records name him as a “mineral water manufacturer”, rather than a “wine merchant” and he married an American woman named Bertha (who was born around 1870) sometime around 1893. Court records show that he was found guilty of “working a horse which was in an unfit condition” in July 1899 and fined 5s. and 7s. 6d. expenses. In August 1900, he was named as one of “Messrs. Taylor Bros.” of Meltham who was attempting to obtain a beer licence for a grocer’s shop on Brow Road, Paddock. However, as Taylor didn’t reside there, it was not granted. The 1901 Census lists the couple with a 3-year-old daughter, Eva Irene Taylor, and living with his older brother, jeweller Henry Taylor, on Market Place, Meltham. They then spent some time in the United States, where a son named Henry was born around 1907. By the time of the 1911 Census, they were back in Meltham and living at Law Cottage. Vincent was born around 1862 in Dewsbury and moved to Huddersfield where he married local woman Ellen Hirst in 1890. He lived for a while with his in-laws in Almondbury before moving to Netherton and he worked as a “platelayer“, which meant his job was to inspect the railway line for wear and tear and obstacles. He is recorded as joining the Amalgamated Society of Railway Servants union in 1896. On that March morning, he set off early at around 5:30am from Netherton to walk the line to Lockwood and found the body of a man by the side of the line at Butternab Bank. As no trains had run yet that day, it was assumed the man had been hit by a train the night before and had suffered extensive injuries to the neck and head. Vincent ran to fetch help, finding local Police Constable Ruddick, who ordered the body moved to a nearby log cabin. A Mrs. Crowther also assisted in laying out the body. Height, 5ft. 6in. ; dark brown hair, ginger moustache, and blue eyes ; dressed in blue cloth jacket and vest, fustian trousers greasy on front of legs, black overcoat and cap ; black, white and red check shirt, blue and white scarf, grey stockings and light laced boots. The only articles in the pockets were two clay pipes and two tobacco boxes. By the following day, the Yorkshire Evening Post reported that the deceased had been identified as 33-year-old John Allen Woodhouse, an unmarried mill hand who lived on Plover Lane in Lindley.8 He had visited his aunt in Netherton on the day of his death and was least seen leaving her house that evening. John Allen Woodhouse was born 24 November 1863, the son of local weaver James Woodhouse and his wife Mary, and was baptised at All Hallows parish church in Kirkburton on 2 November 1865. By the time of the 1891 Census, aged 28, he was living with his older sister Matilda and two younger brothers at the family home on Plover Road. It appears that their parents were both dead and Matilda was now the head of the family. At the time, John Allen was working as a “cotton piecer”, which meant his role was to mend broken threads. He took a long time over his tea, and sighed several times while he was having it. He had not been well for some time and had been under the doctor, and he made a remark to her to the effect that he thought it was nearly all over for him. She told him that she thought he would look up again, and he replied that he did not think he would. He talked very little, but answered her when she spoke to him. Ann went on to state that John Allen’s father had been twice in an asylum and had died in Wadsley Asylum (Sheffield) about three weeks before. John Allen’s brother then told the inquest that the deceased had not worked for nearly a month due to ill-health and seemed “run down” — presumably he had been deeply affected by his father’s illness and death. Ann stated that John Allen had left her house at around 7pm and that she supposed he intended to head home to Lindley (about a 4 mile walk northwards of Netherton). Instead, it seems he wandered down either Nether Moor Road or Butternab Road and then onto the railway line where he waited for it to get dark. Given the nature of the injuries, he likely laid with his head on the line and was struck by one of the last trains of the day — none of the drivers had reported seeing anything on the line that night, so the body laid undiscovered until the following morning. The jury returned a verdict that he had probably committed suicide but it was impossible to know the exact state of his mind at the time. John Allen Woodhouse was laid to rest at Holy Trinity parish church, South Crossland, on 3 July 1896. If I can find his gravestone, I’ll add a photograph to this blog post. Reported in the Railway Accidents 1876: Return of Accidents and Casualties (July-September 1905) that goods guard Christopher Mallinson had been in charged of the 4:35pm goods train from Meltham to Lockwood. Seven waggons were uncoupled at Lockwood and “allowed to run into the shoot road” at the station. Maillnson claimed he couldn’t then stop the waggons using his brake and “consequently used two sprags, one of which rebounded and struck him, breaking his leg”. A weaver named Sam Gill (55), widower, who lived at 13, Batley Street, Moldgreen, with his two daughters, was found lying dead on the railway near Beaumont Park this afternoon shortly after the train which had left Meltham at 1:38 had passed. His head was completely severed from his body. Samuel Gill was born around 1859 in Fulstone, New Mill. The 1911 Census lists him as a 52-year-old widower and living with him were his nephew, Ernest (aged 26), and two daughters, Alice (aged 24) and Jane Gill (aged 12). His wife, Janet, had died in 1909, aged 50. The inquiry into his death heard that “the deceased had been somewhat peculiar of late” and that a witness had seem him climb over a wall near Beaumont Park and lay his head on the railway line as the train approached. A verdict of “suicide whilst of unsound mind” was recorded. Yesterday afternoon the headless body of a man was found on the Meltham branch line of the railway near Beaumont Park, Huddersfield. The man was apparently about 45 years of age. I could find no further articles about this apparent suicide, but 1921 was a year in which headless bodies were found on railway lines near Buckhurst Hill (March), Euxton (July), Etchingham Station (August), Bath (August), Newton St. Loe (September), Cambridge (December) and Hull (December). In the last case, the inquest heard that Robert Turner was in the habit of removing his shoes and sleeping wherever he was — his boots were stood neatly beside his decapitated body, so it was assumed he had decided to sleep on the railway line! Wyndan Bradley (60), Midland Street, Huddersfield, a foreman platelayer, fell from the platform at Netherton railway station, near Huddersfield, today and injured his back. He was detained in the Huddersfield Royal Infirmary. Likely the Post got the name wrong, and this was Wyndham Bradley, born in the village of Leintwardine, Herefordshire, circa 1891. By the time of the 1911 Census, 21-year-old Wyndham was living with his married sister, Mary Priestley, at Bottoms Wood in Slaithwaite and working as a dyer’s labourer for a woollen manufacturer. A couple of years later, he married local woman Gertrude Moore in Slaithwaite on 11 October 1913. Gertrude was born in 1890, the daughter of Fred Moore and his wife Emma (née Bamforth). It seems Gertrude’s father died before she was born, aged only 23, and the 1891 Census finds Emma and daughter living with Emma’s parents, labourer Joseph Bamforth and his wife Charlotte, in Upper Holme, Slaithwaite. At that point, 25-year-old Emma was working as “cotton card room hand” — before cotton could be spun into a thread, it had to be carded to align the fibres and Emma would have operated a carding machine, and this was a low-status job in the cotton factory. Emma’s siblings also mostly worked in the local cotton factories, as “cotton spinners”, “cotton piercers” and “cotton twiners”. Gertrude continued to live with her grandparents until her marriage. By the time of the 1911 Census, she too was working in the cotton mills as a weaver and perhaps she worked in the same mill as Wyndham? A set of four empty carriages that had been left in a siding on the branch line rolled down towards Lockwood, likely released by vandals.12 A quick-thinking signalman (presumably at Meltham Junction) routed them off into the good yards but they ploughed through the buffers and went over Swan Lane, crashing into the booking office of the station. Amazingly no-one was injured, although the stationmaster and a booking clerk were trapped in the rubble and had to climb out. Martin Bairstow’s The Huddersfield & Sheffield Junction Railway: The Penistone Line contains a couple of photographs taken by Peter Sunderland showing the aftermath of the crash. The one reproduced below shows the damage after the carriages had been removed. This wasn’t the first time an accident like this had happened — 16 empty wagons had rolled free from a siding on the evening of 9 September 1953 and crashed a wooden fence, leaving one blocking Swan Lane and two others teetering above the road. Prior to that, in October 1913, a train had been shunting truck of coal when a few of them broke free, demolishing the buffers and wrecking part of the signal box. The Manchester Guardian (29/Oct/1913) reported that two trucks full of coal fell 40 feet onto the road below and five more were left hanging down the embankment. The signalman (W.G. Brackenbury of Newsome) had jumped to safety through the window of his signal box, sustaining only minor injuries. With the closure of the line to passenger services in 1949, it was used purely for transporting goods. Despite opposition from businesses in Meltham, particular David Brown’s, the branch line officially closed on 5 April 1965 and, following one last train carrying dangerous chemicals which ran to Meltham in January 1966, the line was dismantled in the autumn of 1966. After 100 years, the Meltham Branch Line was consigned to the history books. On Saturday 29 May 1880, a lavish ceremony took place to commemorate the formal handing over of around 25 acres of Dungeon Wood to the people of Huddersfield for the establishment of the first public park in the town — Beaumont Park. The donor was Mr. Henry F. Beaumont (1833–1913), of the Whitley Beaumont estate, and his wife cut the symbolic first sod of earth. On the day itself, the event didn’t go quite as smoothly as planned — the Mayor’s initial speech was drowned out by one of the bands who were still marching towards the venue and, no sooner had Mrs. Beaumont cut the sod of earth, the fence keeping the public at a distance collapsed, allowing the hoi polloi to mingle with the dignitaries. With the route to the steps blocked by the crowd, the Beaumonts and the Mayor and his wife had to clamber up “three or four feet of boarding” to get onto the grand stand to make their speeches. During Beaumont’s speech, he appears to criticize the Ramsden family — the then owners of Huddersfield. Since around 1870, the Ramsdens had leased an area of land to the Huddersfield Corporation, known as Greenhead Park. Even after Beaumont had generously donated Dungeon Wood to the town, the Ramsdens seemingly refused to give away Greenhead Park and, instead, the Huddersfield Corporation ended up having to buy it from them in the mid-1880s. An opinion piece in the Chronicle on 1 June felt the event lacked pomp (“a flag or a piece of bunting was a rare sight”) and that the general public in attendance had been rather unappreciative of the generosity of Mr. Beaumont (“Huddersfield might have had a park given every year, so undemonstrative were the mass of the people”). The following is a transcription of the event which appeared in the Huddersfield Daily Chronicle (31/May/1880). A small number of errors in the original article have been corrected and speeches reformatted in italics, but, due to the nature of the transcribing such articles, there may be occasional typographical errors introduced. If you spot any, please leave a comment! An image of the article is reproduced below the text. I’ll likely blog a bit more about this subject, but the Meltham Branch Line — which operated for nearly a century before closing in the mid-1960s — has left an indelible mark on the local landscape and holds a particular fascination for me as our house would have been a good vantage point to watch the trains go by on the other side of the short valley which runs from Netherton village down the hill towards Big Valley. The line was built by the Lancashire and Yorkshire Railway (L&YR) company in the 1860s, taking nearly 5 years of construction before it was deemed safe to carry passengers, despite only measuring 3½ miles. The build was beset by numerous problems — from unstable ground and landslips to collapsing tunnels and opposition from landowners — but would become a vital and lifeline during the Second World War. The Huddersfield.org site has an excellent overview of the branch line and I’ll try to avoid repeating anything from there. From there, the track follows the contour of the valley-side through the lower edge of Dungeon Wood, running below what would become eventually Beaumont Park a couple of decades later. Much of the ground here proved unstable and required some serious engineering to make the trackbed safe from landslips. In February 1866, the Huddersfield Chronicle reported that heavy rain was suspected of contributing to a landslip which caused nearby properties to become unsafe — in particular the toll-house at Dungeon bar had developed alarming cracks and the toll collector was steadfastly refusing the enter the building. As you can see from the photograph, the walls of the cutting slope inwards to the ground, but this wasn’t originally the case — originally they rose nearly straight up to a height of nearly 40 foot. On the morning of Monday 1 October 1866, when it was noticed that the upper side of the cutting was beginning to collapse at the base, workmen spent the day carefully clearing the cutting of tools and equipment in fear of an imminent collapse. 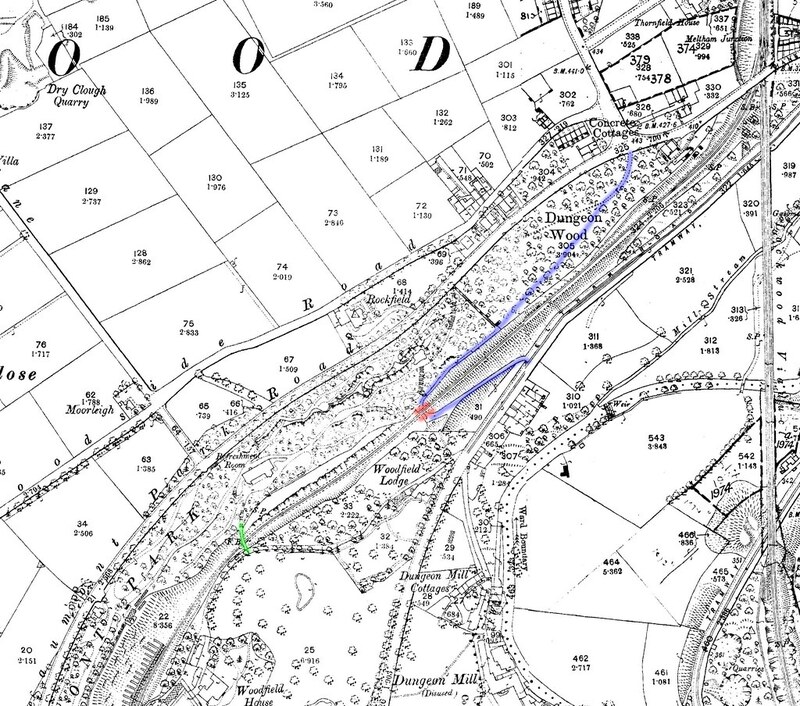 Below the cutting lay Woodfield House, at the time owned by Bentley Shaw, a vocal opponent of the branch line, and it seems he heard what was happening and ordered his servants to empty his outhouses which were sited between the cutting and Woodfield House. At 7:45pm, the walls caved in over a length of 40 yards, completely filling the cutting and causing part of the hillside above to collapse. Huge boulders were loosened by the slip and rolled down the hill towards Woodfield House, but their momentum was slowed by a large stone wall at the edge of the property, which was demolished over a length of 50 yards. Three weeks later, a further landslip caused part of Meltham Road to collapse, leaving a large hole in the road. Understandably, local residents began to fear parts of a nearby embankment, which was apparently only being propped up by wooden railway sleepers that were already warping due to the weight, might collapse and destroy their houses. The southern end is now on private property and inaccessible, but the Forgotten Relics web site shows how it’s been converted by the owners. On 13 April 1864, construction began on this end of the tunnel with the symbolic removal of the first mound of earth by John Worth, manager of a dye works in nearby Armitage Bridge. 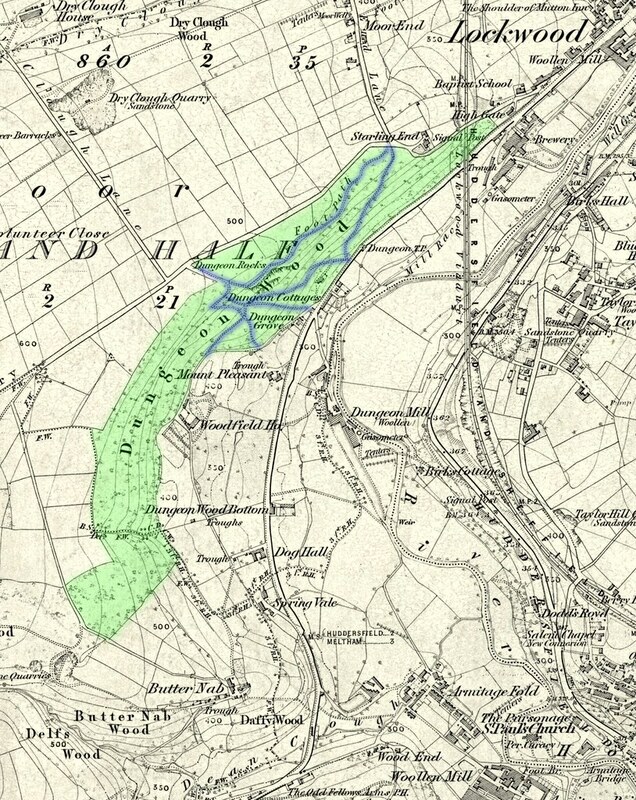 The positioning of the tunnel had proved contentious, as a Mr. Tolson was the owner of a natural spring (which you can see in the photograph on the Forgotten Relics site) which ran close to the tunnel entrance and presumably Tolson received income from channelling the water down to the dye works. After the railway company guaranteed the water would not be contaminated by the construction work, they invited Mr. Worth to the ceremony where he was presented with a new spade by Jesse Kaye, owner of the nearby Big Valley Hotel, which he used to cut the first sod. The Huddersfield Chronicle later reported on an accident which occurred on the afternoon of Friday 11 August 1865, during the latter stages of the construction of this end of the tunnel. A local sub-contractor, Joe Marriott, had been working with a group of men to remove some of the wooden supporting beams which had propped up the tunnel roof. Apparently he felt his colleagues were slacking and, “in a state of excitement”, grabbed an iron bar and began prizing out one of the beams which suddenly gave way, bringing down more of the beams and a section of the surrounding framework. Joe was buried under much of it, crushing his body. His was still alive when his co-workers dug him out, but the newspaper reported “the principal injuries being internal there is little hope of his recovery”. It seems almost certain that this was the Joseph Marriott who was born in Huddersfield, the son of local cordwainer John Marriott and his wife Harriet (I suspect her friends joked about her becoming Harriet Marriott!). Joseph was baptised at St. Peter’s parish church in the centre of Huddersfield on 4 February 1833. By 1851, aged 19, he was working as a joiner and living with his widowed grandmother, Susy Ellis, on Swine Market in Huddersfield. In 1855, he married widow Ellen Smith of Heckmondwike and they had at least one child together, Joseph, along with two children from her first marriage. The good news is that Joseph seemingly made a full recovery from the accident and the 1871 and 1881 Censuses report the family living at 80 Northumberland Street in the centre of Huddersfield, with Joseph continuing to work as a joiner. He eventually died in 1884, 20 years after being dragged barely alive from Butternab Tunnel. His wife Ellen passed away on 8 October 1887, leaving an estate worth £392, which implies Joseph did well for himself — that’s the equivalent of around £45,000 today. I’ll blog more about the injuries and deaths associated with the branch line in a future post. The tunnel passes under the village of Netherton and emerged almost immediately into Netherton Station, where the platform edge ran right up the tunnel. This photograph by James shows the unusual shape of the tunnel. During its construction, there had been partial collapses in October 1864 and August 1865, due to the shale rock running at an angle rather than horizontally, which had left the vertical side walls of the tunnel unstable. The latter collapse caused subsidence in the village above and the Huddersfield Chronicle (26/Aug/1865) reported that house of Jonathan Lund1 had to be demolished as it had become dangerously unstable. To help better distribute the weight of the tunnel — and the village above! — the side walls were rebuilt to curve inwards. In late November 1866, heavy prolonged rain led to floods throughout the north of England and the Huddersfield Chronicle (24/Nov/1866) covered the extensive damage but reported that, amazingly, there had been no known local loss of life. An area around the southern end of Butternab tunnel was washed away, blocking the existing stream which exacerbated the flooding below Netherton. At the station end of Netherton Tunnel, a landslip buried a part of the station, which was currently under construction. The line now swings south-west and runs along the Holme valley towards Meltham, running parallel to Huddersfield Road. Once you know what you’re looking for, the line is very easy to spot in the valley as trees have grown on the raised embankment. A good vantage point to view from is Wood Bottom Road, on the other side of the valley. This photograph, taken from Huddersfield Road, shows the old trackbed running across the middle of the image. Whether it’s possible to get down there and walk along the line, I’ve yet to find out! The small Healey House Station appears to have been built primarily for the benefit of the owners of Crosland Hall and Healey House, and apparently the families of both houses would hire a train every August and head north to Scotland for the grouse shooting season. Shortly after the station, a false 90-foot tunnel was built so that the trains would not spoil the view from Healey House. From Healey House, the line pushes on straight for the end of the line in Meltham, crossing once over Huddersfield Road near at Hall Heys. As can be seen in this photograph from 1910 (from the Kirklees Image Archive), the approach to “Iron Bridge” was fenced in as apparently horses on the road were too often spooked by the trains. After the line closed, the embankment was levelled and the bridge abutments mostly pulled down, although the bases are still there at either side of the road if you have a keen eye. One final note, as detailed on Huddersfield.org, Meltham Mills was one of the few places in the country to manufacture and repair vital gears during the Second World War. Whereas the factories in Coventry and Birmingham were repeatedly targetted by the Luftwaffe and put out of action, the Germans seemingly knew nothing of the little Meltham Branch Line and its steady stream of repaired armoured vehicles and supplies of new gear boxes. Huddersfield school pupils are helping a special community project take shape and learning about local heritage as they go. The students are working with Friends of Beaumont Park on a lottery-funded scheme to research local railway history and manage nearby woodland. The scheme received £49,900 from the Heritage Lottery Fund in 2012 and is supported by Kirklees Council, which owns the site. It has seen youngsters from five of the area’s schools help clear the old Meltham branch railway line to create a heritage walking trail. They have also designed information boards and created wood carvings for benches near the trail’s entrance, which were put in place yesterday. Teachers have been trained in Forest School techniques to help them use open space to encourage interactive play, health, recreation and personal development. Everyone involved in the scheme has been learning about nature and the importance of effective woodland management. Schools taking part in the community project include Moor End Academy and South Crosland Junior School. The scheme is scheduled for completion in 2015 and will also see the creation of an attractive open space for local people to enjoy, as well as a series of nature talKs, leaflets, signposts and trail markings. Meltham branch railway line closed in 1965 and the new heritage walking trail follows its original track bed. Peter Turner, of the Friends of Beaumont Park, said: “As well as local schools, Kirklees Council, as owners of the site, actively support the project through help from various departments. “Volunteers for the Friends group will work with them and Environmental Alliance to create an attractive open space for all the community to use. “It is money from the Heritage Lottery Fund which has made this project possible and the Friends of Beaumont Park are extremely grateful to them”. The following contract for Beaumont Park appeared in The British Architect.